Who said it was time to let the old ways die? Not only is Bradley Cooper’s directorial debut of A Star is Born the fourth (maybe even fifth) iteration of this story, but Cooper begs us to be transported back to a different style of film-making. He directs naturally, but doesn’t brandish a specific style to attach his name to. Instead, he works through the classic plot-lines of this story by constructing it as a good classical filmmaker would. He lets the performances breathe. He lets natural elements coincide with the glamorous nature of movie stardom and the importance of being able to just stick a camera between two people and letting them perform. Modern film is often predicated on this idea of the director’s voice. It’s not that Cooper doesn’t have one, it’s that he allows his voice to be expressed by paying homage to the classical epics he grew up watching, and he breathes new life into this recycled property by making an old movie in modern times. His muse is actually Lady Gaga, a powerhouse performer obscured by her eccentric outfits and refusal to be typecast as a specific style. She’s a pop artist, sure. But, she also does duets with famous crooners, acts in horror television shows, and brandishes an ability in this movie to slide from southern roots rock into modern glam pop without the blink of an eye. Her stardom was plenty established before she was cast in this film. Her reputation as a legitimate and consummate professional can only grow from here. After the 1930s originally gave us the overlooked What Price Hollywood and the original actor-focused A Star is Born, the property really hit its stride by casting maligned but magnificent actress/singer Judy Garland in the 1954 version, which remains the most critically acclaimed. While What Price Hollywood from 1932 bears extreme similarities to the plot that became A Star is Born, the real tell was that the same director from that film went on to direct Garland’s version in 1954. The fifties version changed it from upcoming actress to upcoming singer, and then became a rock opera in the much-maligned but cult classic 1976 version starring Barbara Streisand and Kris Kristofferson. Cooper’s 2018 version floated around development hell for a few years, originally with Clint Eastwood attached to direct. Cooper, sensing a maturity and a readiness to begin making his own input on film, decided to direct. 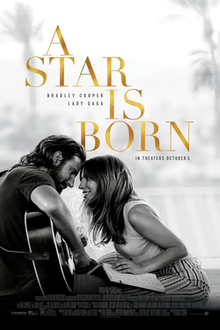 For those who don’t know the plot, the basic premise is that an already situated and possibly declining star (Bradley Cooper’s Jackson Maine as a southern rock icon) discovers a new down-on-her-luck talent and begins propping her up. In this case, it’s a miserable waitress Lady Gaga getting her escape from normality by performing French ballads in a drag bar. Once Cooper’s Jackson Maine meets Gaga’s Ally, he immediately becomes smitten by her talent and tenacity. Unlike some of the other versions, he remains culturally relevant, but her star begins to outshine his, and it deals with their romantic relationship, as well as professional, over the years as their careers evolve. This movie gives more a voice to the male lead, as Jackson Maine is less of a declining star and more of an overheated one ready to supernova. He’s still selling out arenas when we first meet him, but his brother/manager (Sam Elliot) can’t contain his drinking and excessive pill-usage, and Jackson wanders through most of every day drunk and alone before plugging in his guitar. Past issues with his father and brother take a daily toll on him, and his drinking and drug addictions are serious enough to be immediately noticeable, but he hasn’t quite self-destructed yet. When he meets Gaga’s Ally, he wants to stop and drink at a local bar that he doesn’t realize is a drag bar until he’s already committed. Ally then performs, and blows him off of his feet, immediately wanting to start a relationship. Even as the two fall in love, and Ally’s star is born (and rises to the top of the pop charts), Jackson’s own inner-demons hold him back. The biggest compliment I can give this movie is the way it handles the modern celebrity relationship. So much of tabloid reporting these days is asking rhetorical questions about why two famous people would get together, or why they would split up, or why they would stay together despite the very public faults. This film shows us in an up-close-and-personal way exactly how a dysfunctional celebrity relationship could work. They’re in love, and they’re good for each other, but they both have so much interior baggage that it creates public friction where it should be private. Jackson’s drinking would be private if he weren’t a famous musician. This is also a good place to address a criticism that’s been floating around, mainly dealing with Jackson’s (and therefore Cooper’s) rejection of Ally once she becomes a pop star with all the tools (the backup dancers, the backing vocal track, etc.) The only person who looks bad in this rejection is Jackson himself. The movie unapologetically lets Ally be herself to the point where she rejects certain things proposed by the studio. We gain respect for her by dictating terms, but we also lose respect for Jackson in being rude and unfair to her. The movie succeeds in making Ally self-empowered, such that Jackson’s criticism bounces off of her and makes him seem like a drunken, bitter fool. It’s rare in this movie that Jackson moves from being the ultimate supporter to a negative presence, and that was refreshing because of how often the movie kept me guessing about where his lowest moment would come. When it did, he immediately seeks help and rehabilitation to the point where we love and sympathize with both characters. Gaga is great, and her defining scene is how she goes from a nervous bystander covering her eyes while singing to a confident musical prodigy in the space of one song. If you can come up with a better scene in a movie this year, let me know, because the first live performance of the Shallows song is really special and could go down in all-time movie moments. It’s Cooper though, maybe because he’s also the director, who steals the movie with his performance. We’ve seen him fast-talk and aggressively act his way through two fantastic David O’Russell projects with Silver Linings Playbook and American Hustle, but O’Russell’s window is very specific to him as a director. Cooper’s success spans outside of that, however, with powerful lead performances in American Sniper and Limitless. In sum, he’s flirted with being a great actor before, but the commitment lies here in this film. He worked with a vocal coach to lower his voice an entire octave to sound more like Sam Elliot, which he also uses to his seductive advantage. He also worked tirelessly with Gaga and other musical professionals to sing and play the instruments successfully. The best way to direct these frames is to film it live and then edit the sound quality in post, and in order to do that, Cooper had to get to a place where he was a comfortable enough performer. To do something like that is essentially to invent a skill you didn’t even know you had. He just steals every scene in this because you can’t get enough of the voice, the mannerisms, the emotion, the attentiveness, the complexity of the character. Finally, the songs are just fantastic. The acoustic-rock start fueling the pop explosion of Gaga’s Ally is extremely true to life. We see the rock star that takes the back seat to something new. Cooper may want to remind everyone of 70s film-making and music, but he makes a good case for progress as well. If you like Fright Fest at Six Flags or Halloween Horror Nights at Universal Studios, you’d know that the horror mazes within the parks are a special experience. They force you to walk head-on into terror while loud noises play over speakers and people leap out at you with different costumes and fake weapons. Turning that into a horror film idea actually was really exciting, and although Hell Fest is your average teen horror film, the best parts of it feel like you are walking through one of these real-life mazes. Our group of friends are all attending “hell fest,” a local festival with various rides and haunted mazes that operate like the aforementioned ones at any major theme park near you. The lore is that there was a girl killed at one a few years ago, where the killer left her body in the rafters as a prop. Now, someone in a common mask is following our group around, and we don’t know if it’s an especially dedicated employee or someone up to something far more sadistic. The best part of the film is how successfully it captures that amusement park experience. There are parts that are legitimately tense and scary because of the movie’s work to capture that specific feeling. Outside of this gimmick, however, there really is nothing to write home about. The characters are cardboard cut-outs, the kills are relatively uninspiring, the intention to have the teenager group be made up of as many personalities as possible results in some really tiresome performances, and the whole thing just drags on slightly too long. It’s not the type of horror film that I can’t even believe was ever made, but this isn’t anything above mediocre. Mandy operates between the space of experimental film-making and riding on rhythm and feeling. With a heavy metal soundtrack and explosively colorful visuals, it tells a largely wordless story through visuals and body language to mostly success. However, there’s a part of this film that will leave you cold and unsatisfied, and it’s one that probably will require multiple viewings to fully digest. I’m essentially submitting my score for this without prejudice, wanting to watch the film again in a different light before really determining whether I think it’s worthy of an additional analysis that would raise my opinion of it. Although I liked the visuals and attempt at primal fear and rage, the movie drags on at immense length, and often feels more like a student passion project than a cohesive whole. 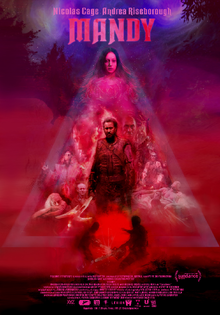 The story is about a cult who takes Mandy, Nic Cage’s girlfriend, and he sets out in a drunken, drug-filled rage to avenge her. It takes almost two hours for the action to set in, relying mostly on building tension and visual motifs up to that point. It was a little much to wait that long for what I wanted as a viewer, which is the violence and explosive performance from Nic Cage that had been talked up so much going in. Once the blood starts flowing and the movie changes from a tension filled psychological horror to something heading into action, I felt an appreciation for this change. All in all, though, it just feels like a grind to get through the whole run time, occasionally feels pretentious, and doesn’t have enough of the zaniness that would elevate it to being more easily consumed. It still is well acted, constructed, and presented enough for it to be worth a viewing or two.